(Bloomberg) -- Indians increase purchases of refrigerators and TV sets around election time as the government puts more money in the hands of voters, which stands to benefit some of the world’s most profitable consumer finance companies. Prime Minister Narendra Modi is following his predecessor in boosting spending before polls due early 2019, a practice that has sparked surges in stocks of consumer finance firms. 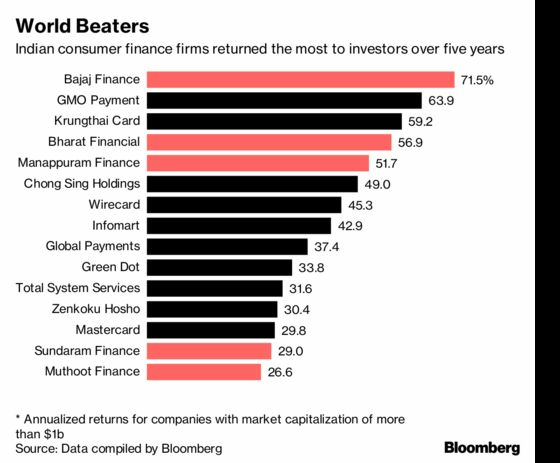 Bajaj Finance Ltd. -- with a world-beating return of about 70 percent over the past five years compared with 30 percent for Mastercard Inc. and 3.5 percent for Samsung Card Co. -- saw its best performance during this period in the 2014 election year. 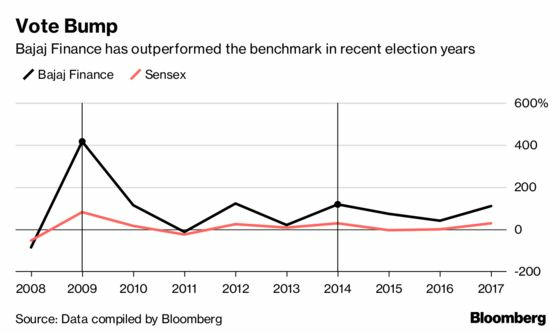 “Hope and euphoria” resonate through consumer habits during Indian elections, said Abhinav Angirish, managing director of Abchlor Investment Advisors Pvt., a Mumbai-based wealth management firm that has $417 million in assets. Rising consumer spends will boost consumer finance and other related stocks, he said. Consumer finance firms benefit because while the government boosts public spending in the run up to elections, this trickles down as purchases of tractors and trucks and eventually into retail purchases of televisions and toasters. Non-bank companies like Bajaj Finance will gain about 50 percent market share by 2021 from 32 percent now, according to Icra Ltd., the local unit of Moody’s Investors Service. Credit Suisse Group AG recommends buying housing finance companies as construction of affordable homes will gather steam before India’s vote. Analysts at UBS Group AG and Jefferies pick Shriram Transport Finance Co. as a firm that will gain from the government’s vow to raise rural incomes. The central bank’s move this week to raise its key policy rate for the first time since 2014 won’t significantly affect consumer purchases, said Karthik Srinivasan, senior vice president at ICRA Ltd. Private consumption accounts for more than half of India’s gross domestic product. However, this had been dampened by Modi’s decision to invalidate 86 percent of currency in circulation late in 2016 followed by the chaotic rollout of a new sales tax last year. Following these policy shocks “the industry is pinning its hopes on more sops, and government spending on infrastructure and development projects putting more cash in people’s hands,” Angirish said.